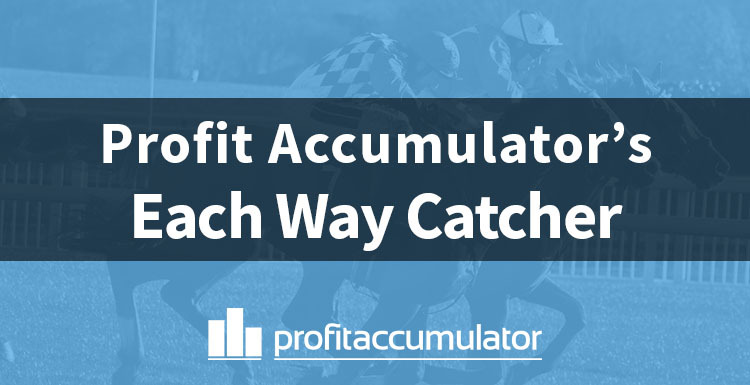 Profit Accumulator's Each Way Catcher is an advanced matched betting tool that helps members maximise profits from horse racing. Like the oddsmatcher and, Acca Catcher, Match Catcher and dutching software, it helps users quickly find each-way bets with low qualifying losses. Each-Way Catcher is available to all Platinum members. An each-way bet is two bets rolled into one. The first bet is betting on the horse to win and the second bet is on the horse to place. In traditional gambling, if the horse wins, then you win both bets, if the horse finishes in the place positions then your place bet wins and your win bet loses. If it fails to finish in the place positions then both of your bets lose. With matched betting, we can neutralise or limit any losses by laying both parts of the bet with an exchange. By laying both the bet to win and the bet to place, members can make sure qualifying losses are kept to a minimum. This can be useful when mugging or, more profitably, for taking advantage of extra-place offers. For example if Bet365 are paying out five places on a horse race, but the Betfair lay market only shows "four to be placed". This means if you place an each-way bet and your horse finishes fifth, you actually win both bets, which can result in big payouts. Each-Way Catcher shows and sorts close matches on each-way horse racing bets, including the each-way back odds with the bookie and the lay odds on both the win and place with the exchange or exchanges. Members do not have to manually search for close each-way matches and can use Each-Way Catcher to find bets that suit their requirements. Search results can be filtered by bookmaker, exchange, minimum and maximum rating, extra place offers and timeframe. The TV filter can also be checked, as bookmakers often have offers depending on where the event is televised. The results include the date and time of the event, the name of the horse, the bookie and exchanges, the odds, how many places will be paid and how many runners are in the field. The integrated calculator shows a step-by-step guide on what to do and how much to stake on the back and lay bets. 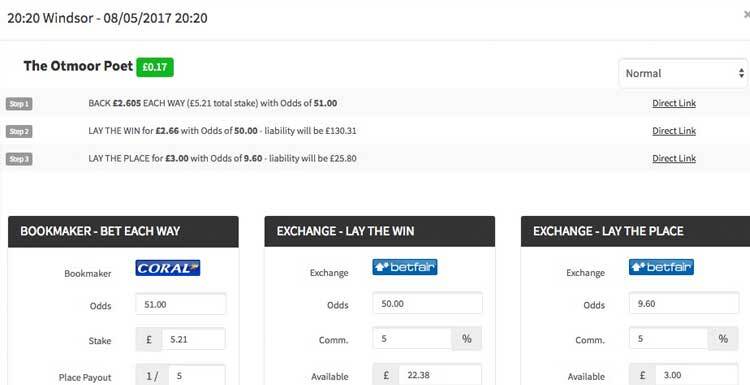 The calculator also includes direct links to the bookmakers or exchanges.